David Carrier reviews reviews Paul Resika: Geometry and the Sea at Steven Harvey Fine Art Projects (through May 20) and Bookstein Projects (through May 26). 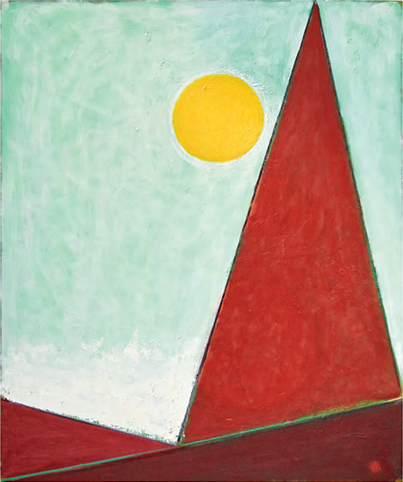 Carrier writes: " ... as if working in a highly personal way through a Gombrichian history of figuration, [Resika] juxtaposes backgrounds of clear skies, with yellow suns, with jagged pyramids in the foreground. And this show falls into two, distinctly different parts. Bookstein Projects shows a roomful of these enigmatic works, Resika’s more conventional paintings, variations on this theme. And at Steven Harvey’s gallery, in addition to the beach scenes, you also see several works, which are harder to place — A Quiet Romance (2017), showing a conch shell on a similar background, and, in the back room, the magnificent Self-Portrait with Rag (2017). Resika, you sense, keeps his options open. For this reason, my schematic history hardly does justice to the bold originality of all of these paintings. Look at Triangle- Sun (2017) at Harvey, or Rose Dawn, also 2017 at Bookstein. These prickly images set against the sky, which have no sources that I can identify, are a law onto themselves."